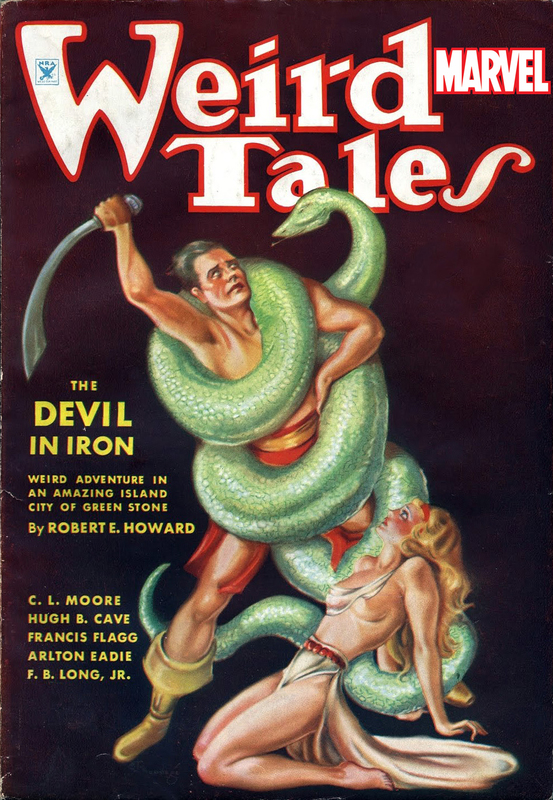 The following is the first in a series of dissection and discussion of select Marvel adaptations of stories first appearing in the pulps. These essays will appear on an irregular basis but we'll make sure to give you a heads up beforehand! We're extremely happy to welcome aboard Professor Gilbert Colon. In the shadow of a starlit stronghold, shimmering down upon the thief-city of Arenjun, drunken roisterers and other rogues gather at a tavern for wine and obscene songs. A boisterous Kothian boasts of the treasures of the Tower of the Elephant, and out of the torchlight steps a Cimmerian insisting to know more. While previous issues allowed writer Roy Thomas to spin his own Hyborian Age yarns, “Tower of the Elephant” was the first to adapt a Robert E. Howard short story directly from the pulp pages of Weird Tales magazine (March 1933), with the rest of his Conan bibliography to follow. The comic-book version “Tower” begins in Arenjun, a name later concocted by sword-and-sorcery author L. Sprague de Camp. The man of Koth regales the room with tales of a great jewel, the Heart of the Elephant, guarded by the diabolical high priest Yara, and Conan’s curiosity is satisfied ... until the belligerent Kothian insults his barbarian honor, lays hands on him, and ultimately draws his sword. 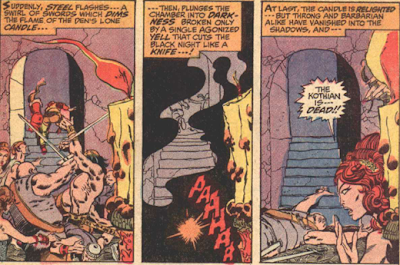 In a flash of steel and snuff of candle, the Kothian lies dead and Conan has fled. Otherwise Thomas exercises laudable fidelity in adapting Howard’s original text, more faithful than purported admirers such as de Camp and Lin Carter, who posthumously anthologized Howard’s work in bastardized form. 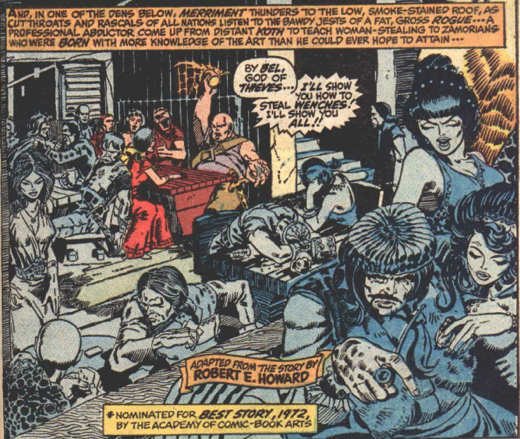 (Thomas would later adapt “Tower” a second time for Marvel’s Savage Sword of Conan #24, and Dark Horse did their own in Conan #20 [September 2005, and collected in Conan Vol. 3: The Tower of the Elephant and Other Stories] by author Kurt Busiek and illustrators Cary Nord and Michael Wm. Kaluta). Conan wastes no time spying on Yara before stealing into the Tower alone, or so he believes. A freshly slain guard is evidence he is not the only one looking to poach the Elephant’s Heart. It is not long before he stumbles upon the culprit, a fellow thief by the name of Taurus of Nemedia, and the two quickly forge a friendship of mutual self-interest and respect. With an impressive economy of storytelling, Thomas fits Howard’s short story into 20 deft pages, with nothing significant missing, only abridged. He retains a great deal of Howard’s poetic prose, inevitably sacrificing some but gaining in return brisk pacing. Together they breach the garden where they are set upon by a pride of lions, who strangely neither roar when attacking nor whimper when they die in the thick green-yellow cloud of Taurus’ deadly black lotus powder. Suddenly another silent lion leaps upon them, one that escaped Taurus’ death of the flowers, and only through Conan’s savage instinct and quick-footedness does he split the beast’s skull in half. If the stealthy infiltration of the Elephant’s Tower rings familiar, it is because the 1982 movie Conan the Barbarian from director John Milius borrows from it for his Tower of Serpents sequence. The differences are mere furniture rearranging – Conan adventures not with his comely companion from the film, Valeria, or the loyal thief-archer Subotai, but a Nemedian prince of thieves; instead of the Tower of Serpents they scale the Tower of the Elephant; the wicked priest-sorcerer is Yara, not Thulsa Doom; instead of a giant snake, they slay a gigantic black spider; instead of the Heart of the Elephant, the jewel they steal is called the Eye of the Serpent; finally, instead of the episode beginning in a Zamorian tavern, it ends up in one. Taurus suggests they split up and peer over the rim sides for soldiers or other movement below. Conan complies, against his wary nature, and suspects “civilized trickery” when he finds that Taurus slipt inside the rooftop dome. Conan turns toward the door, and then, a strangled cry. The door swings open and Taurus collapses dead into Conan’s arms, the only marks of violence two small wounds at the base of his bull-neck. Cautiously Conan peers inside the chamber – empty. Empty except for the myriad jewels dizzying the Cimmerian. Empty except for a hairy black horror baring great frothing fangs dripping venom, a monster spider soundlessly springing at him in swift attack – the same killer that dropped from its perch on the neck of his short-lived Nemedian comrade! 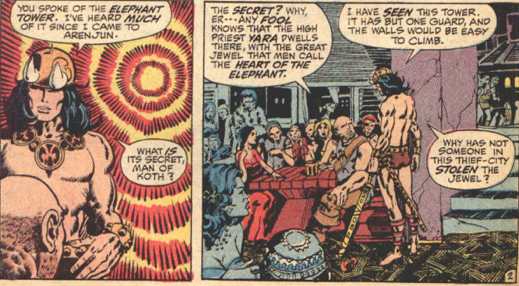 There is even a serpentine motif underlying the elephantine imagery that could have inspired Milius. 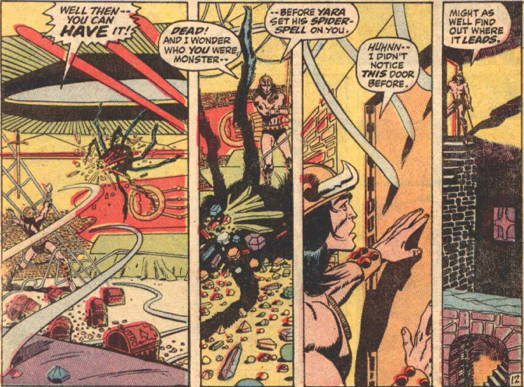 Describing the sorcerer-priest (Yara, not Thulsa), Howard writes “his hiss was like the voice of a cobra.” Taurus says about Yara’s tower chamber, “We are in the serpent’s lair, and we know not where he lies hidden.” In the chamber, “... three or four silken couches [were] embroidered with gold and worked in strange serpentine designs.” Spider web-strands “writhe about [Conan], python-like” and hold “him like ... the coil of a python.” The Nemedian relates a past brush with a giant snake when he tells Conan he “stole [the black lotus powder] out of a caravan bound for Stygia, and I lifted it, in its cloth-of-gold bag, out of the coils of the great serpent which guarded it, without awaking him.” The infernal-sounding “Stygia” is the land of Thoth-amon, the demonic servant of the evil Serpent-god Set from Howard’s “The Phoenix on the Sword” and the inspiration for shape-shifting Set-worshiper Thulsa Doom from Milius’ film. It is said that Roy Thomas regretted the literal pachyderm interpretation of Yag-kosha, the monster central to the story, but what Barry Windsor-Smith and Sal Buscema draw mostly matches Howard’s description of a Ganesh-like deity, and as such it would be interesting to learn what else Thomas had in mind. Conan, determined to go through to the grim finish of the adventure, follows the exotic scent of incense to a large chamber. 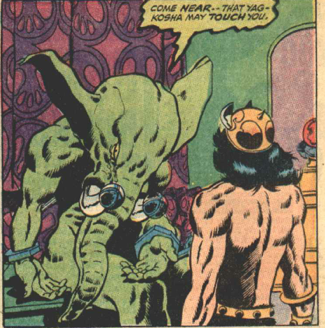 Inside, seated on a great marble couch, he discovers Yara’s god, an idol with the green body of a man and an inhuman head – wide flaring ears, the curling proboscis, white tusks – its eyes closed, as if in sleep. And then ... those eyes ... OPEN! Howard is a skilled enough storyteller to get away with the standard dragon or giant for the yarn’s centerpiece monster, but surprises us with something unique that lives up to his originality and imagination. 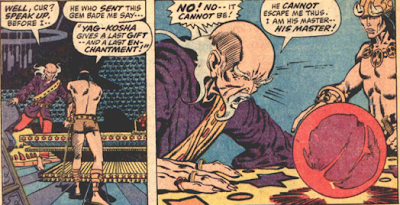 Here in “Tower,” as in “The Phoenix on the Sword,” Howard crosses the threshold into territory pioneered by fellow pulp master H. P. Lovecraft, right down to the linguistics of Yag-kosha’s name. The Cimmerian freezes in his tracks – it was no graven image, but a living thing. Sensing this horror to be blind, his paralysis thaws and he backs silently toward the door. Though drawing inspiration from Lovecraft’s mythos – “Elder World” is one hint – Yag-kosha and the green planet Yag are completely Howard’s own invention. In his Los Angeles Times review of Michel Houellebecq’s absurd H. P. Lovecraft: Against the World, Against Life, Stephen King unfairly dismisses Howard’s “stories of Conan the Barbarian [as] barely disguised Lovecraft pastiches,” but Howard further makes this variation on Lovecraft his own in how his yarn plays out. In the Lovecraft universe, to stare into the face of cosmic horror is to end in nightmare and madness. Had Lovecraft penned “Tower,” the aghast Conan would in likelihood have succumbed to stark terror and been reduced to a gibbering lunatic. 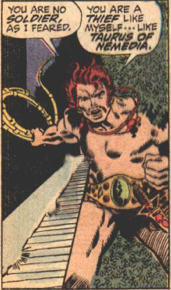 But Conan faces “the madness and nightmare,” looks straight into the blind eyes of this “demon of the Elder World,” and is moved to help the bound and piteous creature. Conan, tough-souled Cimmerian from fierce wastelands, gazing upon monster’s tears and chains, feels not horror or revulsion, but a strange aching sadness and great pity. Yet Yag-kosha is “neither god nor demon,” as it explains to Conan, but flesh and blood. The strange being, calling itself Yag-kosha, touches Conan’s face with its trunk. “You are not of Yara’s race of devils.” It senses all that has brought Conan here – the slain guard, the slaughter of his Nemedian cohort, all of it. 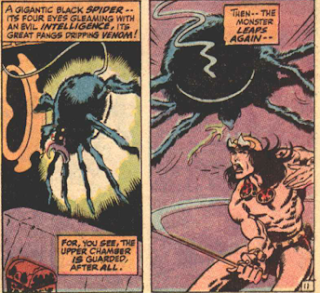 “Oh man, listen,” the monster begins in a low chant, sharing its origins – “There are many worlds besides this earth, and life takes many shapes” – as well as the primeval origins of the world around Conan. From the outer fringes of the universe flew Yag-kosha and others from his homeworld, the green planet Yag, upon mighty faster-than-light wings which fell from their shoulders when they came to earth. Stranded, they dwelt apart from man and watched them build shining cities and kingdoms. When Yag-kosha relates to Conan a tale from the long, long ago when earth was young and Atlantis still ruled above the waves, the deceptively simple action adventure begins to resemble an excerpt from his densely imaginative essay “The Hyborian Age,” more testament to Howard’s ambitions in elevating the pulp short story form into something approaching literary heroic epic. until Yag-kosha alone was left, dreaming of old times among the ruined temples of lost Khitai, worshiped as a god by kindly jungle-folk. Then came Yara, who at first sat at his feet and learned wisdom before tricking and turning Yag-kosha’s own power upon him when he refused to divulge black secrets. The enslaved Yag-kosha, mastered by fire and rack and pent up in the cryptic tower of magic he built for Yara in a single night, did Yara’s foul bidding for three centuries, “blackening my soul with cosmic sins, and staining my wisdom with crimes, because I had no other choice,” the plaintive monster laments. Further proof of Howard’s lofty aspirations is Conan’s unexpected pity towards the maimed, racked, and burned creature, resulting in a seemingly ordinary adventure yarn transformed into cosmic tragedy on the emotionally visceral level of Mary Shelley’s Frankenstein. 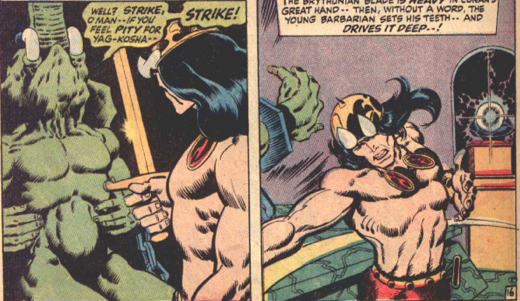 enlisting Conan as “the hand of Fate.” He begs Conan to first drive his sword into his breast, then take the altar gem, the Heart of the Elephant, to Yara. With a heavy heart, Conan drives his heavy Brythunian blade deep, saying “Fare you well, Yag-kosha! I never killed ... with so unwilling a thrust.” The blazing jewel turns the color of blood, and sure that Yag-kosha’s life had fled – or at least life as Conan understands it – Conan is dutifully off to fulfill the final wish of the sad creature. Ultimately Howard’s “Tower” climaxes in a dream-like, alchemical finale that blends pathos, empathy, epiphany, retribution, and redintegration with a surrealism that is truly worthy of the description “Weird Tale” in every sense of the term. Very cool! 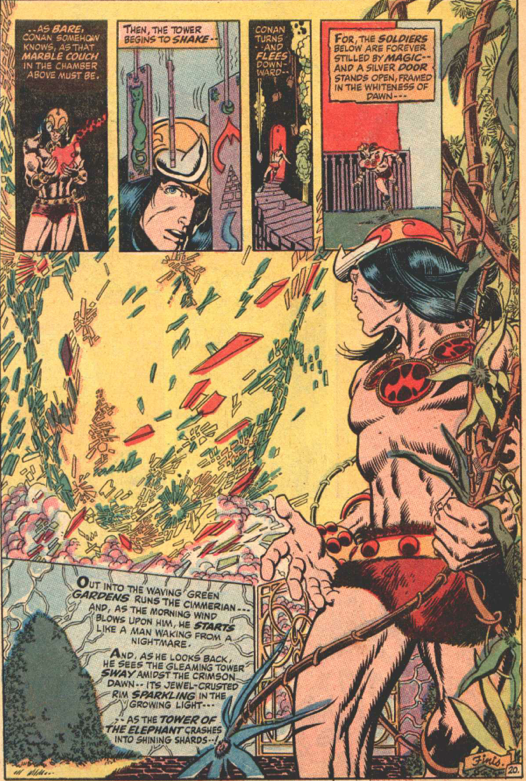 I was 7 or 8 years old when my father started bringing home Conan comics, but I never paid much attention to them. The panels you reproduce look fascinating! I read my first Conan story a year or two ago because it was free on Kindle--"Red" something or other. Your excellent report makes me want to read more! July 1971: Kree! 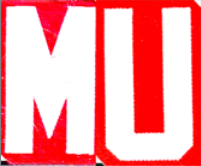 Skrull! War!! May 1971: Whatever Knows Fear...!